One of the main fields in the satellite business is Little LEO Messaging Services. A possible use for such systems is automated meter reading – collection and distribution of small portions of data from various sources over large areas. 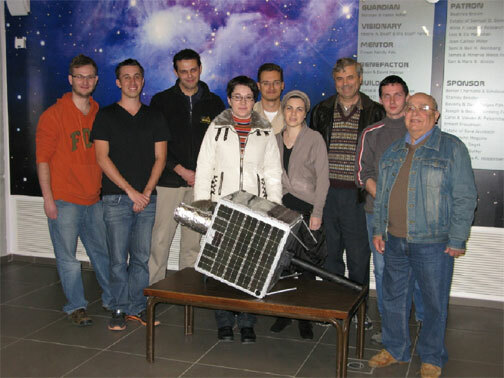 Thus the primary objective of SABRES was to design a constellation of microsatellites, with the ability to monitor thousands of satellite modems all over the world. The number of clients (meters) and the frequency of the communication sessions were chosen to simulate a realistic demand. The designed constellation includes 8 satellites, equally along 2 planes. The orbits are circular, with altitude of 900 km, inclination angle of 63[deg] and relative RAAN between the planes of ΔΩ=120 [deg]. The ground segment includes 3 ground stations located in Haifa, Canberra and Los-Angeles. The chosen combination of space segment and ground segment allows to access more than 200,000 users each day, with at least 50% of a daily-monitored users. Each satellite is a conventional cubic form with side length of 0.5 m, and mass of 38 kg. The communication with the meters is conducted through UHF band using store-and-forward technique. The communication with the ground station is conducted through VHF band. For those purposes 5 antennas were placed on the nadir-oriented side – one for VHF, and 4 for UHF. In addition to the primary task, a secondary scientific mission was proposed. Utilizing the design requirement for a global constellation, and the equipment that was chosen in the conceptual design stage, the team proposed to monitor the Earth’s magnetic field. This is accomplished using a TFM-65 magnetometer (dynamic range of ±60 µT). To shield the sensor from spacecraft induced EMI, the magnetometer was placed on a deployable 5m boom, which also plays a major part in satellite control, adding gravity stabilization. The attitude determination and control system composes of sun-sensors and GPS as sensors and magnetorquers as active actuators. The power system is based on silicone photovoltaic cells, providing in average 23 Watts, needed for data transmission and other satellite systems. The thermal system is based on Kapton® isolation. The on-board data handling system was required to accommodate the communication with the clients, the scientific data and ground commands, and is based on single-board commercial computer. The chosen launch vehicle, Rockot, is capable of delivering 4 satellites to the required orbital plane. Maneuvering for in-plane dispersal is done using a cold-gas propulsion system. In addition to technical aspects, the project also encompasses management issues, including risk analysis, reliability calculations and project’s cost estimation. The guiding line was to design a simple and cost-effective design and only a number of critical systems were designed with redundancy and high reliability components. The total reliability value for the whole mission of 5 years was found to be 0.775. The overall project cost (including different expenditures for all segments and operations) was estimated to be 8.2 M$ per satellite.